The 2008 version of Microsoft's Convergence conference was a testament to the maturity of the company's Dynamics product line and provided proof that some of the confusion over Redmond's marketing of its enterprise software line has faded. In other words, there wasn't a lot of news at Convergence, but that wasn't necessarily a bad thing. Past shows have focused-sometimes against Microsoft's will-on Project Green, a now-defunct plan to merge the company's four Dynamics enterprise resource planning (ERP) suites into a single product. This year, Project Green, which had long baffled both partners and customers, was officially pronounced dead. "We concluded Project Green," said Mogens Elsberg, general manager of Microsoft Dynamics ERP at Microsoft. He didn't elaborate. Partners approved of the decision. "[Microsoft] just stopped talking about it," Michael Merfeld, customer director, Microsoft Dynamics, for Seattle-based Gold Certified Partner Avanade Inc., said at the show, held in Orlando, Fla., in mid-March. "They shut up. That's all they needed to do." And partners have stopped talking about it, too -- or, at least, they weren't talking about it at Convergence. That left plenty of time for other topics, such as AX 2009, the forthcoming update to the AX suite that's due by the end of June. 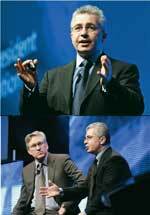 Kirill Tatarinov, corporate vice president for Microsoft Business Solutions (above, and with Microsoft Business Division President Jeff Raikes, below), emphasized the ease of use of Microsoft's Dynamics applications during his keynote speech. The fact that AX 2009 was the main news hook at this year's Convergence event is another clear indicator that the Dynamics product line has matured. Last year, Dynamics CRM Live (now Dynamics CRM Online) was the talk of the show and still something of a novelty. Now, the customer relationship management system, which can be deployed either on-site or in a hosted model, is old news-despite the fact that Microsoft is just now rolling out for general availability. Bigger picture, which indicates that Dynamics is no longer a product line that's taking shape and evolving -- it is here, in full, and customers and partners are talking about it in concrete terms rather than just looking to the future and discussing roadmaps. As they did with most of Microsoft's Dynamics offerings, company officials focused on ease of use when discussing AX 2009. In fact, Kirill Tatarinov, Microsoft's still-new corporate vice president for Microsoft Business Solutions, devoted much of his Convergence keynote to the user-friendliness of Redmond's CRM and ERP interfaces. The popularity of Zunes and smartphones aside, Microsoft knows more than the average ERP vendor about user interfaces, having produced Windows and Office for years. Usability, or a lack thereof, has derailed many ERP implementations in the past, and Microsoft is determined to differentiate itself by touting the simplicity of its Office-like user interface. The company even did extensive research with the IT University of Copenhagen in Denmark, studying how users react emotionally to software interfaces. Microsoft executives clearly emphasized their view on the benefits the Dynamics line provides for customers. "We really are well-integrated with Outlook, Word and Excel. Your users will appreciate our interface," Microsoft CEO Steve Ballmer said in response to a question about why users might choose Dynamics CRM Online over competitor Salesforce.com Inc.
Microsoft's other major announcement at Convergence was a deal with Electronic Data Systems Corp., through which EDS will provide Dynamics CRM to its customers. "We see the entire Dynamics thing as definitely an enterprise-grade solution. CRM is something we see as our fabric," Ronald A. Rittenmeyer, chairman, president and CEO of EDS, told conference attendees from the stage during Ballmer's keynote.